Q: What does your diet consist of? A: I think the word "diet" is often linked to fads or quick fixes where all you eat is cabbage soup and drink water with lemon and cayenne pepper in it. Blech! I think we have to form our pretty little heads around the idea that "diet" is actually habitual and a lifestyle change. I wish there was a better words for it, but before I get lost in searching a thesaurus for a more suitable word, lets move on. I love oatmeal. I eat it with berries and peanut butter. I mix it with protein powder and bananas to bake yummy 3-ingredient cookies. It's filling and it tastes so good. I like this particular oatmeal because it's really hearty and filled with all the good stuff. I love this bread because it's low in calories, high in protein. It's made from berries and sprouted wheat. Sound weird? Yes, but it's yummy and a great alternative to white bread. I eat a slice with peanut butter, or use a slice for an open-faced sandwich to save myself some calories. I've been obsessed with the Chocolate Chip Peanut Crunch CLIF bars since I was a freshman in college. I think I used up all my Sun Dollars to buy one every morning in my dorm's grocery store, along with a Naked Juice. With 10 grams of protein and a delicious taste, it's a great post-workout treat or a snack when you're on the run. I don't buy any other train mix besides this one. I will drive out of my way, past Fry's and Safeway, to get to Trader Joe's for this trail mix. It's that good. It's a little handful of heaven that has peanuts, cashews, almonds, golden raisins, cranberries, and sweet chips of the peanut butter, white chocolate, and semi-sweet chocolate variety. I eat it as a snack and in my yogurt. Calories seem high at 150 for 1/4 cup, but it's filling and actually has a lot less than other trail mixes. I never knew how to pronounce Quinoa, let alone what it was until I asked someone at the grocery store. You say "Keen-wah" if you didn't know, and it's a whole grain and a seed. Identity crisis! It has really high protein content, which is perfect for vegetarians. I like it with chicken and sauteed veggies, or even plain with a bit of olive oil and seasoning. I am a berry fiend. I ear them with everything. Yogurt, almond milk, oatmeal, salads. I pop 'em in my mouth when I need something sweet. They are my healthy substitute for dessert. 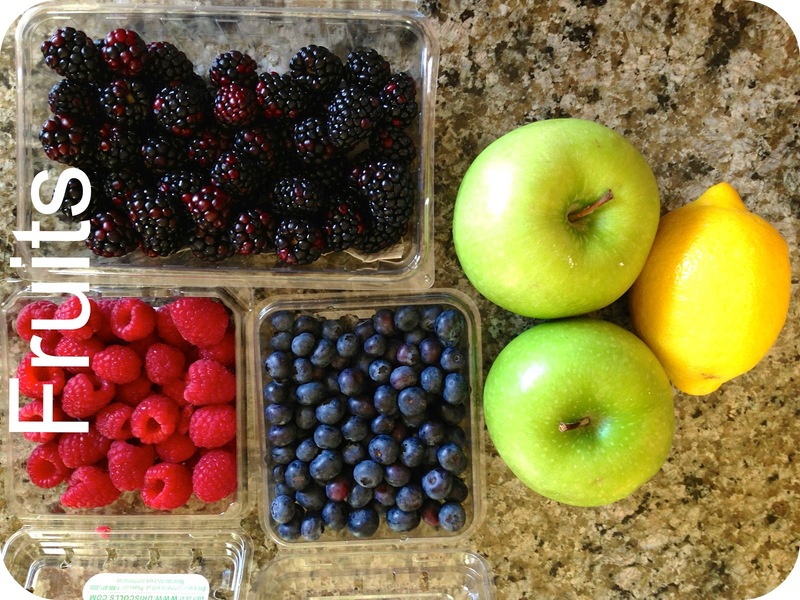 High in fiber, antioxidants, and vitamins. I love apples and peanut butter. It's one of my all-time favorite snacks. I think I buy them solely for that reason. It's a perfect combination of crisp sweetness and a nutty sweetness. High in fiber and vitamin C.
Lemons are great for salad dressing and in hot tea. They are also great as a detox tool. Squirt some in a glass of room-temperature water, and sip it on down. Bananas are a great on-the-go snack. Peel and eat. They are also yummy in cereal, almond milk, yogurt, and oatmeal. I blend them up with my protein for shakes. They are an ingredient in my three-ingredient cookie. They replenish the body with vitamins and have lots of potassium. Lentils are delicious. Hot or cold. I like them over brown rice, with chicken and salsa, or over salads. These are easy to make when you just want a quick dinner. They've got loads of fiber and protein. I sautee zucchini with spinach, tomatoes, and a little bit of olive oil and seasoning. It's great with chicken. I also grate it into long strands to make for a pasta substitute by simply sauteing it in olive oil and adding a tomato sauce. You still get the pasta experience, without all those carbs! I'm avocado's biggest fan. They are so creamy and delicious. I just can't get enough. Yes, they have higher calories, but the fat is good for your heart. They are loaded with fiber, potassium, and vitamins. And after all that, I just remembered that avocado is a fruit. Whoops! Either way, I eat them sliced up on sandwiches, over salads, and by themselves. Spinach and kale are great for salads, or sauteed with some other veggies, or in smoothies. They both vary in taste, but both are delicious. They are loaded with vitamins and health benefits. Look up some smoothie recipes on the web. 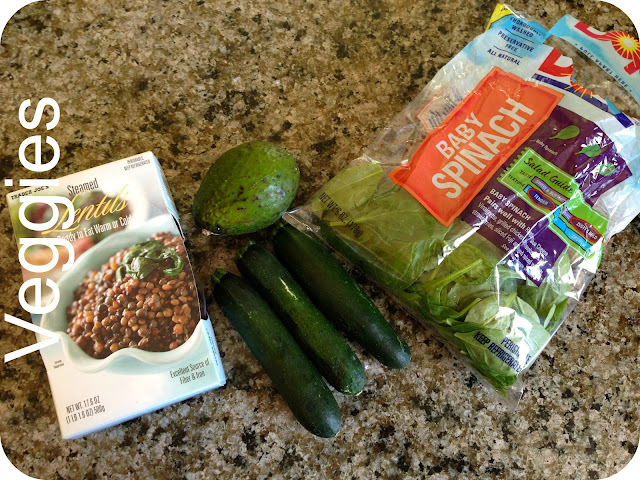 I know it sounds a little nasty to mix spinach or kale with fruit, but trust me, it's good. I use tomatoes a lot. In my sandwiches, on my salads, with chicken, in my zucchini pasta. They are good cold, or sauteed for a hot dish. I like their sweet taste when biting into a sandwich, and I love the juiciness they add to an Italian dish. They are loaded with antioxidants, and since they have a high water content they fill me up. This dressing is low in calorie and delicious over a southwest salad or chicken. It reminds me of my favorite dressing from El Encanto. Mmmm. It's tangy and sweet. With a cilantro base, and sprinkles of pepitas and peppers, it's truly a salad essential. Look above to see why I love avocados so much. I use the spread for sandwiches and wraps. It's a great alternative to fatty mayo! Salsa is my first love. I've been eating it since I was little with tortilla chips. It was my go-to after school snack. 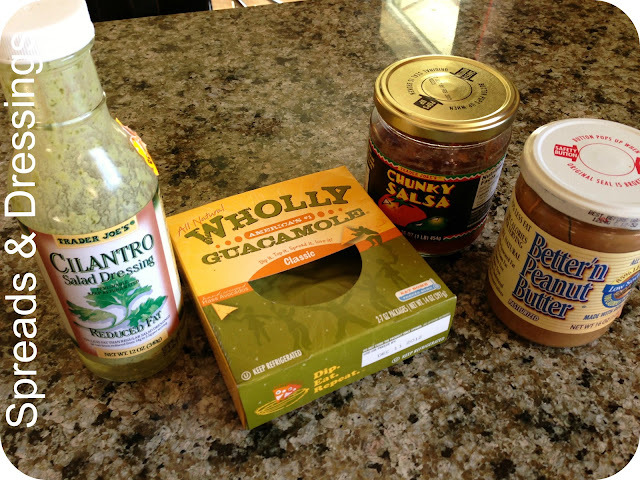 When I realized that tortilla chips weren't the best for me, I began using salsa on wraps, salads, and with chicken. This one is so good because it's not too spicy, but gives the chunky feel of pico de gallo. What's better than peanut butter? Better'n Peanut Butter, of course. It has 40% less calories than regular peanut butter. It tastes just as good as the real thing, but I don't feel as guilty eating it with a spoon. With no refined sugars or preservatives, it's still a healthy dieter's choice. 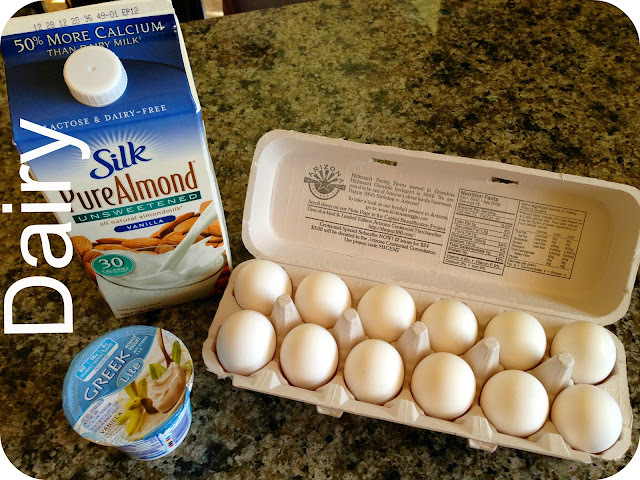 Okay, so Almond Milk isn't really a dairy product, but it's a great alternative. I haven't had regular milk in ages. I'm hooked on this stuff. With only 30 calories per cup, it's perfect for cereal, oatmeal, and by itself. With more vitamins and less calories than soy and rice milks, this is a great choice. It's also high in protein. I like the Original and Vanilla flavors. I have yet to try the chocolate kind! I love the taste of Greek yogurt, but I don't love the high calorie content. So I was thrilled when I tried the Greek Lite Yogurt! It's got a lot less calories, but still tastes great. With almost double the protein of regular yogurts, and a lot less sugar, it's a healthy choice. 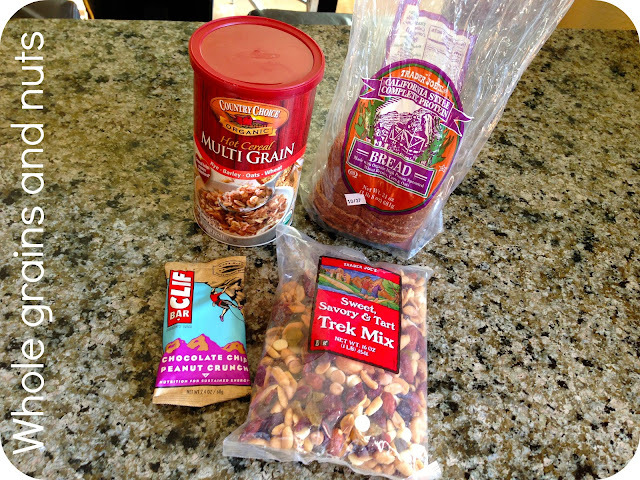 I love it with my trail mix or with shredded wheat and fruit. Yum. I mostly eat egg whites, but sometimes I will add a yolk or two in there because that's really where the nutrients are. I could by the egg whites in a carton, but boyfriend eats eggs too and I use them for baking him treats. I don't mind the extra step of using my egg separator. I love scrambled egg whites and egg white sandwiches. They're delicious and they have plenty of protein. I recently bid adieu to Starbucks and Dutch Bros. sugary coffee drinks, along with Red Bull. Le sigh. It's been a little hard because I was pretty hooked on my caffeine drinks, but I realized they were adding pudge with their empty calories. I even said goodbye to diet soda because I know my body isn't processing those fake sugars. I switched to tea! All three of these flavors are delicious. All with great antioxidants, the Pomegranate White Tea takes the cake in that department. 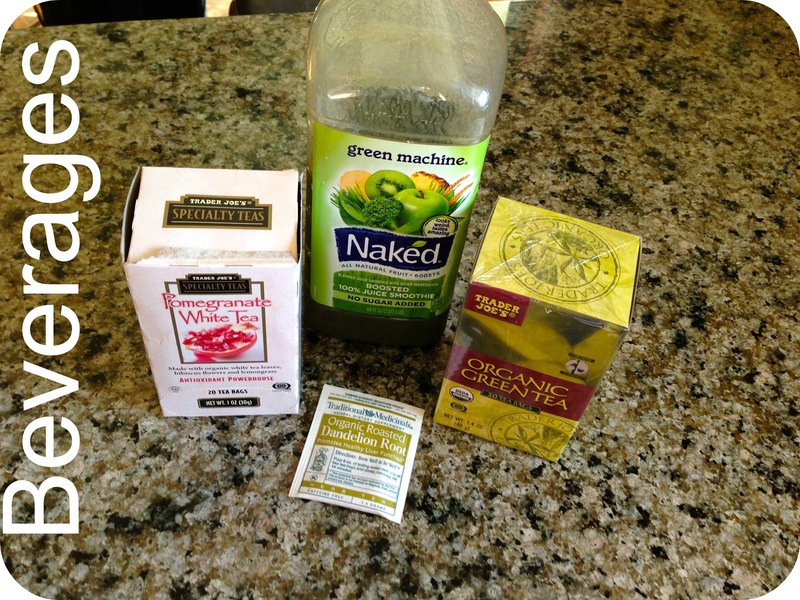 The Green Tea suppresses my appetite, and the Dandelion Root Tea is a great detox. I love the Green Machine Naked Juice. It's full of nutrients, and one cup really fills me up. Sure, it looks a little funky, but it's really yummy. With no sugar added, it's a healthier alternative to all those high-fructose juices out there. So, there you have it. Those are the staples in my kitchen. They're mixed in with Boyfriend's cheese balls and frozen chicken nuggets, but they're there. It's important to have a kitchen that provides you with options. When I have a variety of interesting, healthy foods I'm less likely to nab the junky food in the house. Experiment with your groceries. Make it fun! I have a blast trying out new recipes in the kitchen. Some are failures, and some are masterpieces, but that's the fun of it. Eating healthy doesn't have to be boring.